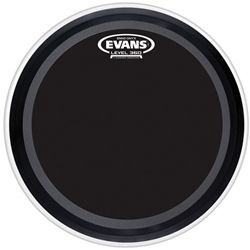 Matts Music - BD22EMADONX Evans EMAD Onyx Bass Drum Head, 22"
Drums → Drum Heads → BD22EMADONX Evans EMAD Onyx Bass Drum Head, 22"
BD22EMADONX Evans EMAD Onyx Bass Drum Head, 22"
Evans coated EMAD batter series features a 10mil of single-ply film providing an ideal balance of punch, power and low-end. The EMAD contains two interchangeable damping rings that maximize attack and low-end without removing the head or reaching inside the drum. The unparalleled industry standard externally mounted adjustable damping system allows the player to adjust attack and focus. The Onyx version is the perfect aesthetic and sonic compliment to the Onyx tom heads and Onyx bass resonant.